Temperatures soared last past week (low 90s in the Jackson) and the snowpack was melting fast. While there are still colorful spots in the sage flats and along the low-elevation wetlands and streamsides, the flower show is rapidly moving up the mountains. Fortunately, last weekend’s rain storms and cooler temperatures will help the flowers persist. Even so, don’t wait to get out to see what’s in bloom! Below are some places I have hiked/botanized this past week . The next post will include photos of common plants you can discover. Also check out past posts for some plant ID. The sage flowers are still blooming! 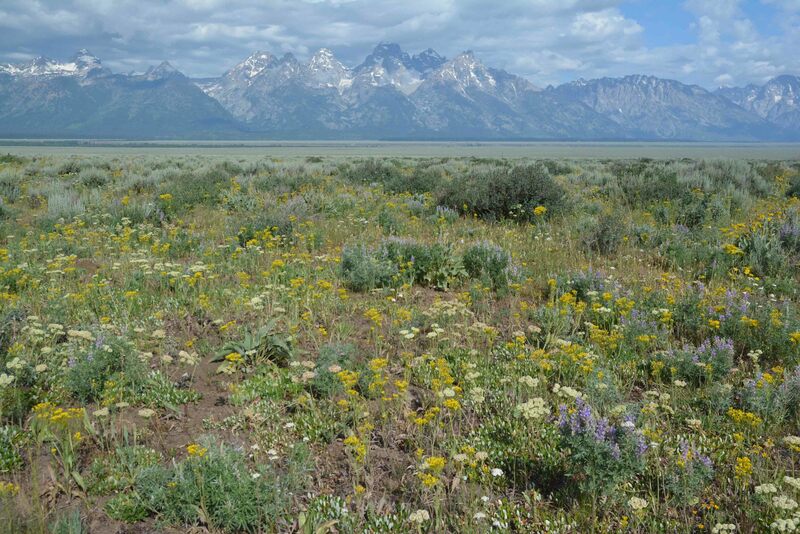 The view from Antelope Flats west to the Tetons is filled with wild flowers. 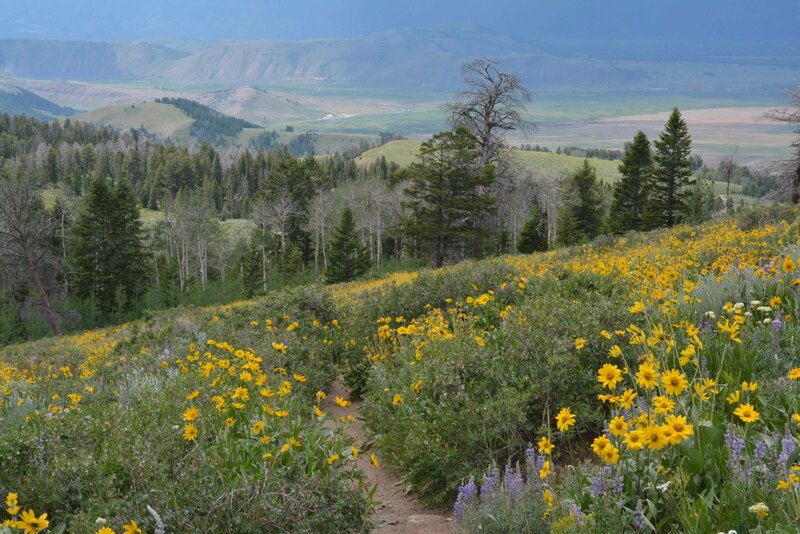 Antelope Flats: Drive the loop around the sage flats to the northeast corner and up the road to the Teton Science School to see Lupines, Hawksbeard, Sulphur flowers, One-flowered Sunflowers, and Sticky Geranium. Prickly Pear Cactus (Opuntia fragilis) is blooming yellow on the rock outcrop by the Kelly Warm Springs pullout. 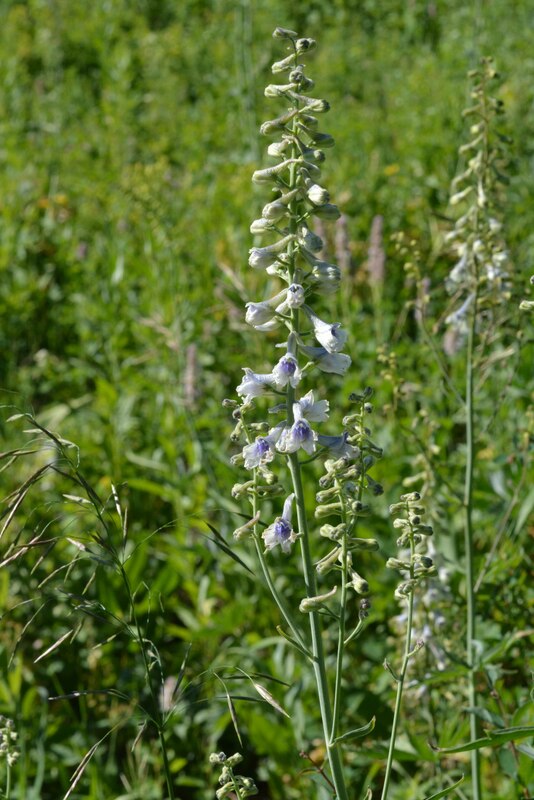 Tall Larkspur, also called Duncecap Larkspur, is indeed 7′ tall where it grows in moist meadows. Moose-Wilson Road: Marsh, moist-meadow, and roadside habitats feature 5’-tall Duncecap Larkspur (Delphinium occidentale) and profuse pink Wood’s Rose (Rosa woodsii). Monkshood grows to a similar height as the Larkspur but has deep blue flowers with hoods. Cow parsnip spreads its broad plate-size clusters of flowers attracting many different of pollinators. Richardson’s Geranium has white instead of pink flowers and has rose-tipped glands. Watch out for the nettles along the wayside. Goodwin Lake Trail has masses of flowers: One-flowered Sunflowers, Lupines, Sticky Geraniums, Paintbrushes and Cinquefoils. 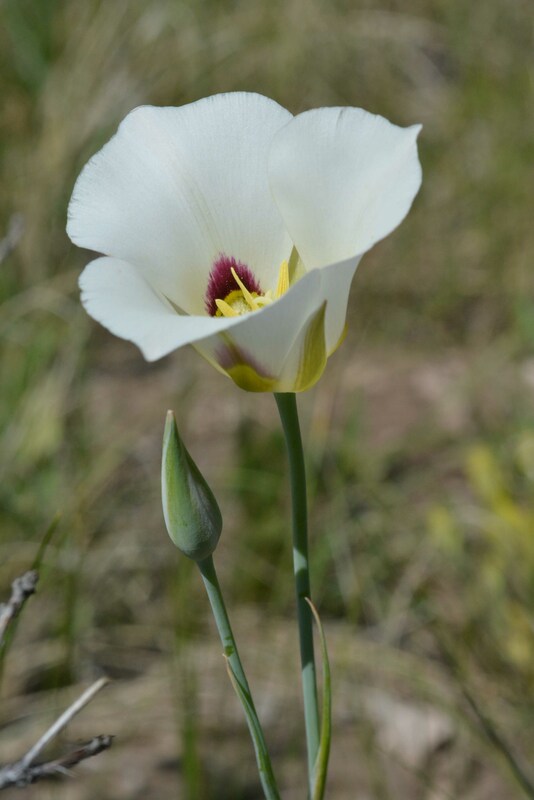 Nuttall’s Mariposa Lily is occaisionally found on dry slopes overlooking the Valley. Elegant but rare Mariposa Lilies (Calochortus nuttallii) and an unusual cream colored Wild Buckwheat (Eriogonum brevicaudata) grow on the dry knoll of the overlook. 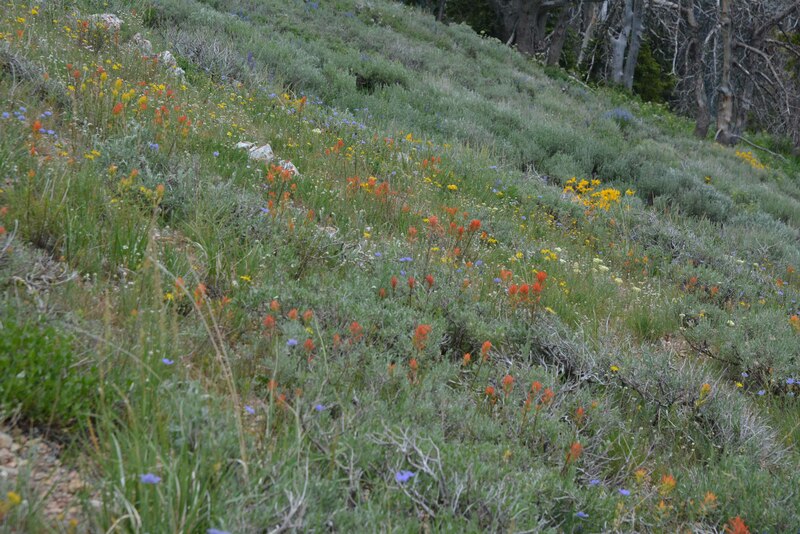 Further up the road towards the Goodwin Lake trailhead meadows are full flowers: wild gardens galore! Paintbrushes, Scarlet Gilia, Sticky Geranium, One-flowered Sunflower, Larkspurs…. Take the boat to Cascade Canyon and expore the forest, slopes, and talus for flowers. Flowers here prefer the shade of the mixed conifer forest, as well as, open sites of talus (listen for pika) and avalanche chutes. White Columbine (Aquilegia coerulea) is surprisingly common. Other woodland plants include Western Thimbleberry, Meadowrue, and the talus slopes feature Red Raspberry, ferns, cinquefoils. Willows are dispersing their seeds upon the wind, and berries of mountain ash, cherry, elderberry, and blueberry are slowly forming. 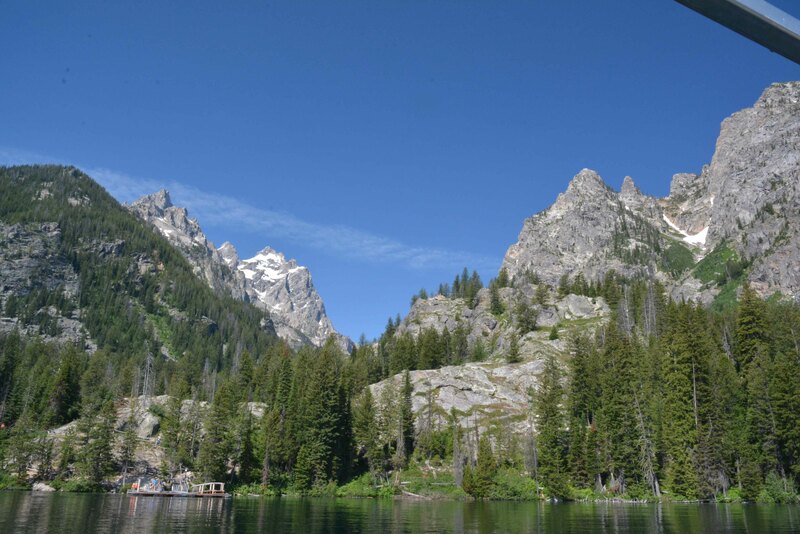 Teton Pass and Ski Lake trails south of the park provide access to higher elevations with meadows and mixed-coniferous forest species. Just south of the high point of the Teton Pass Trail is a mosaic of bloom. I found dozens of different flowers along the 1.5 mile trail ranging from very early blooming Nuttall’s Delphinium and Spring Beauty to sedums, groundsels, three species of paintbrushes, sandworts, cinquefoils, flax, penstemons, phacelia, fleabanes…. 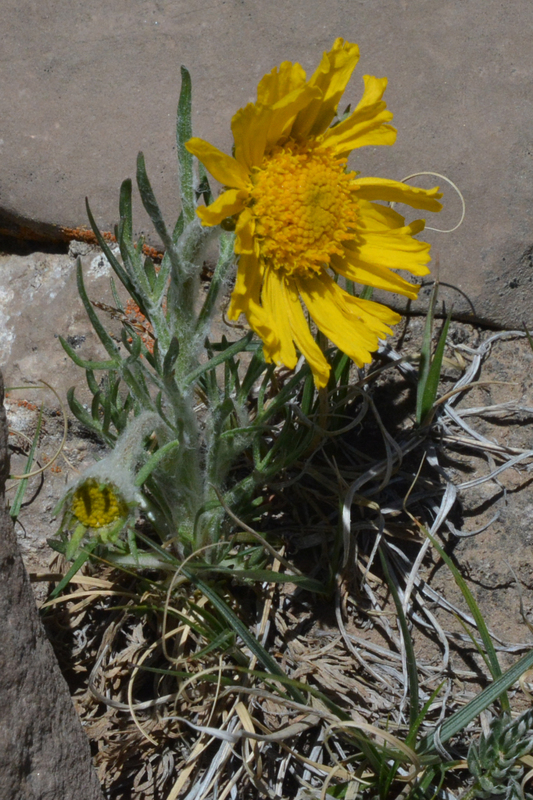 Rydberg’s Sunflower grows to about 6″ on the harsh scree slopes atop Rendezvous mountain. 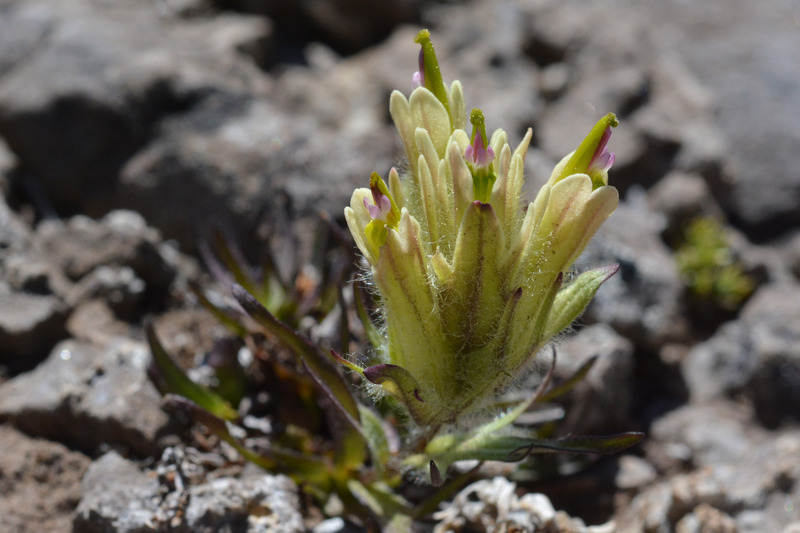 Take the tram up to 10,500 feet to access subalpine and alpine flowers, such as the ever-durable Rydberg Sunflower (Hymenoxys grandiflora) and the diminutive Beautiful Paintbrush (Castilleja pulchella), to name just two alpine specialties. Various members of the mustard family such as Smelowskia calycina and Lesquerella paysonii sprawled on the scree. Alpine Townsendia, Teton Anemone, and Telesonix were also in bloom. Beautiful Paintbrush grows only a few inches high in the rugged alpine habitat. More to come! Let us know what your are finding and where by responding to this blog or emailing us at tetonplants@gmail.com. What Blooms in Wildfire Burns?